I said BEET, not BEEF. If you don't like beets, then you can tune out now, but if you are a beet lover, like me, then please make this recipe. I am almost getting tired of roasting beets but they will soon be plentiful in my garden, so I had better start coming up with new recipes for the orbs. Here is a genius idea and really delicious. 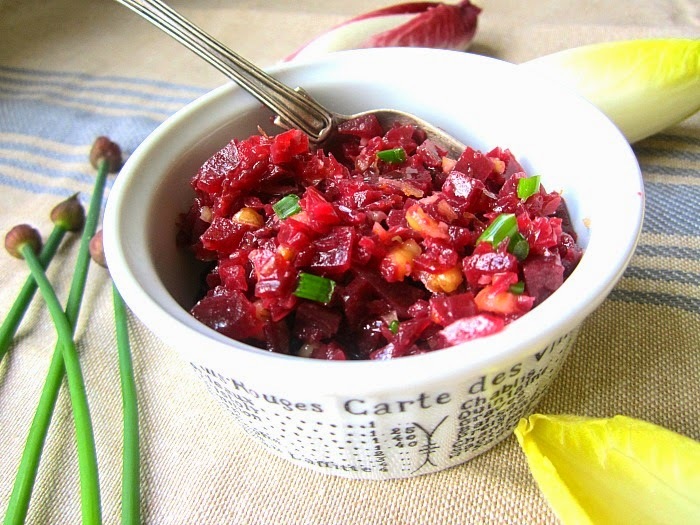 I am calling it beet "tartare", but you can also call it beet caviar or just beet relish! 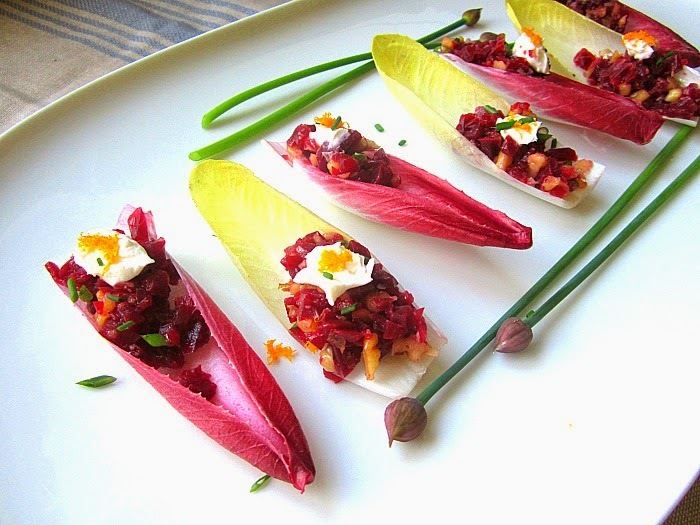 This is an easy, impressive appetizer. Serve them at your next soirée. I did not measure the ingredients, used a handful of this and that, but I will try and be specific for you people out there who must have precision. 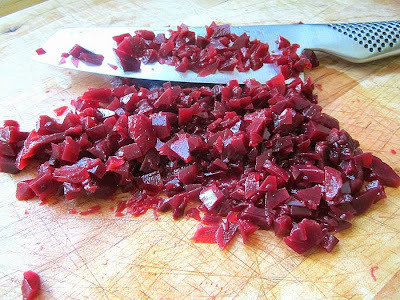 You can also cheat here if you are pressed for time, and use Aunt Nellie's Pickled Sliced Beets in a jar, but make sure you don't add any vinegar if you do (the pickled beets already have vinegar in them). If you are doing the relish the proper way, then when the roasted beets are cool enough to handle, chop them finely with a heavy knife until practically minced. 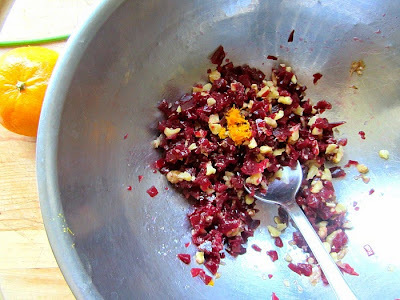 Add the minced beets with the chopped toasted walnuts and half the orange zest to a bowl. Throw in some of the snipped chives. Add in the vinegar and walnut oil and stir together. Taste and add a pinch of sea salt if needed. Spoon into endive spears and dot with creme fraiche and more orange zest. Top with some snipped chives and enjoy! 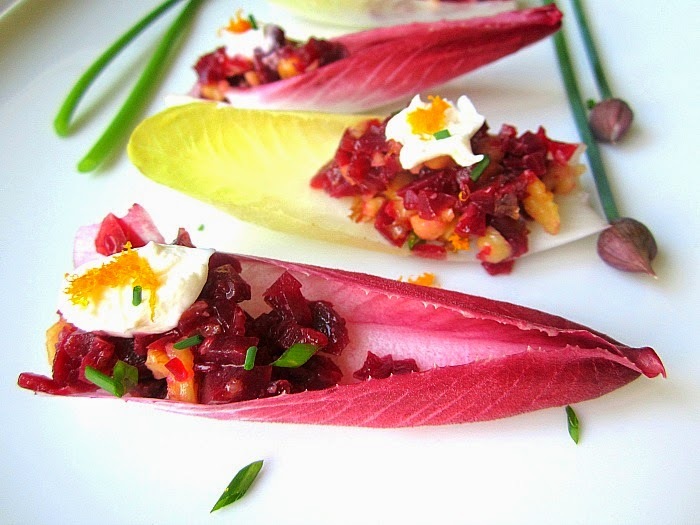 I will be making these beautiful healthy appetizers all summer long! I am a huge beet lover & can't wait to make this. Recently, my husband made beets with horseradish for Easter and used Aunt Nellie's in place of roasting beets. I was horrified - basically he cheated, although in his defense he was pressed for time. 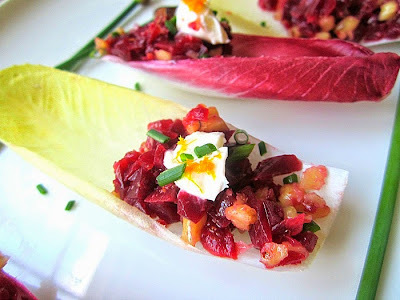 I like the combo of beets and walnuts and the presentation of having them inside endive spears is great! I saw a wonderful version of this with wild violet flowers, garlic chives, and birch syrup in Esben Bang's (chef at Maaemo in Oslo, NO) cookbook a while ago. It looked a bit like a forest floor littered with red rocks. I'm sure your version is no less delicious and the colors are beautiful. Come on spring vegetables!